Refugees and migrants searching for safe havens and opportunities benefit their host nations’ economies within five years of arrival, suggests an analysis of 30 years of data from 15 countries in Western Europe. The study finds that soon after a spike in migration, the overall strength and sustainability of the country’s economy improves and unemployment rates drop. Its conclusions contradict the idea that refugees place an excessive financial burden on a country by sucking up public resources. The study was published1 in Science Advances on 20 June. D’Albis and his team relied on a mathematical model that uses yearly economic indicators to make predictions about the future following major shocks, such as natural disasters. In this case, the events were influxes of immigrants. The researchers looked separately at the effects of migrants — who are legally allowed to settle in a country — and asylum seekers who reside temporarily in a nation while their applications for refugee status are processed. Many of the asylum seekers included in the study were those who fled the war in the former Yugoslavia in the 1990s, and those who have come more recently from Syria. The analysis examined conditions from 1985 to 2015 in Austria, Belgium, Denmark, Finland, France, Germany, Ireland, Iceland, Italy, the Netherlands, Norway, Spain, Sweden, Portugal and the United Kingdom. To assess nations’ economic well-being, the researchers measured average incomes over the years by dividing a country’s gross domestic product (GDP) by the size of its population. They also calculated a variable called fiscal balance, which subtracts the amount of money a country spent on public programmes, such as welfare, from the amount of money raised through taxes. 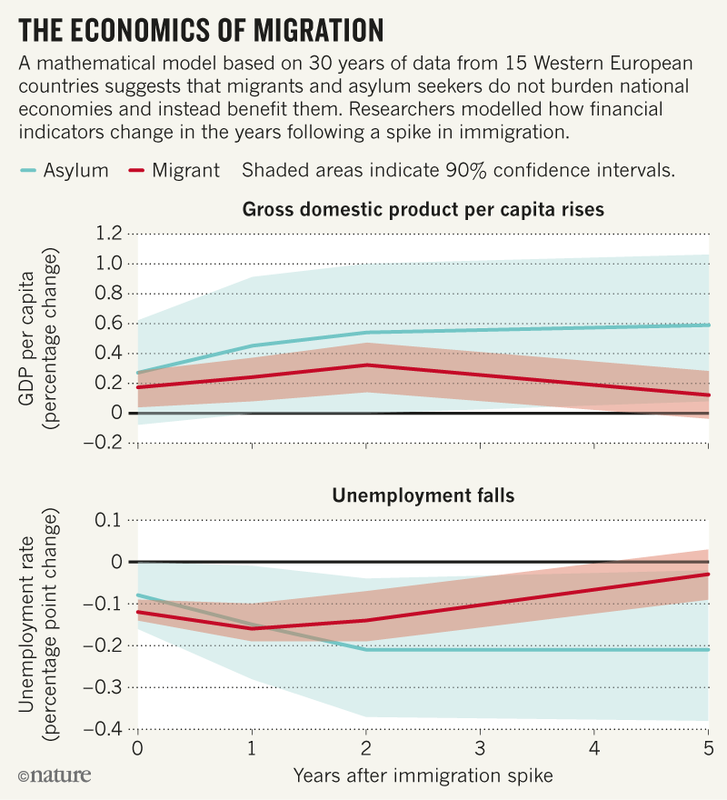 The model suggests that within two years of an influx of migrants, unemployment rates drop significantly and economic health increases (see ‘The economics of migration’). Those effects are likely down to migrants increasing market demand, providing services, adding jobs and paying taxes. The study showed this economic activity far outweighs governmental costs of newcomers — that may be partly explained by the fact that immigrants tend to be young and middle-aged adults who are less reliant on state benefits than are older people, says d’Albis. Asylum seekers also benefit economies, but their effects take longer to transpire — from three to seven years — and the boon is less obvious. Unlike migrants, people seeking refuge often face restrictions on working, and must move to another country if their applications for permanent residency are denied. Michael Clemens, an economist at the Center for Global Development, a think tank in Washington DC, says the analysis is a departure from some previous work because it focuses on big-picture impacts, rather than specific elements in an economy — such as the effect that immigrants have on local wages. “An analogy is that Peet’s coffee shop [a US chain] might have a negative effect on Starbucks, but the competition might be better for the economy overall,” Clemens says. He commends D’Albis’s team for using a mathematical model that substantially reduces the chance that the economic changes result from factors other than migration. “The method greatly limits confounding factors by eliminating those with long-term effects,” he says. 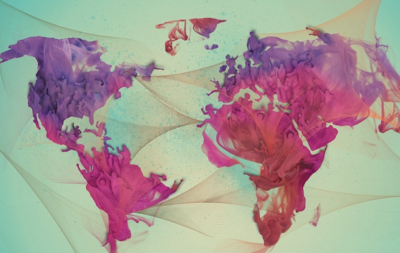 What’s more, the number of nations assessed over 30 years makes such confounders unlikely. At a time when immigration policies are heated and in flux in the United States and Europe, studies such as this can help politicians to assess the consequences of their actions. “If you slash immigration for cultural or security reasons, you will pay an economic price,﻿” says Clemens. Update 21 June 2018: The graphic ‘The economics of migration’ was added to this story. d’Albis, H., Boubtane, E. & Coulibaly, D. Sci. Adv. 4, eaaq0883 (2018).